Forces acting at some angle from the the coordinate axes can be resolved into mutually perpendicular forces called components. The component of a force parallel to the x-axis is called the x-component, parallel to y-axis the y-component, and so on. Where λ is a unit vector. There are two cases in determining λ; by direction cosines and by the coordinates of any two points on the line of action of the force. i, j, and k are unit vectors in the direction of x, y and z respectively. 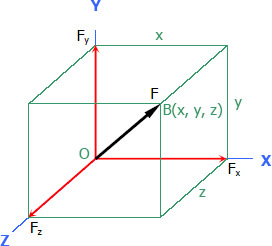 The above rectangular representation of a force is applicable in both 2D and 3D forces.